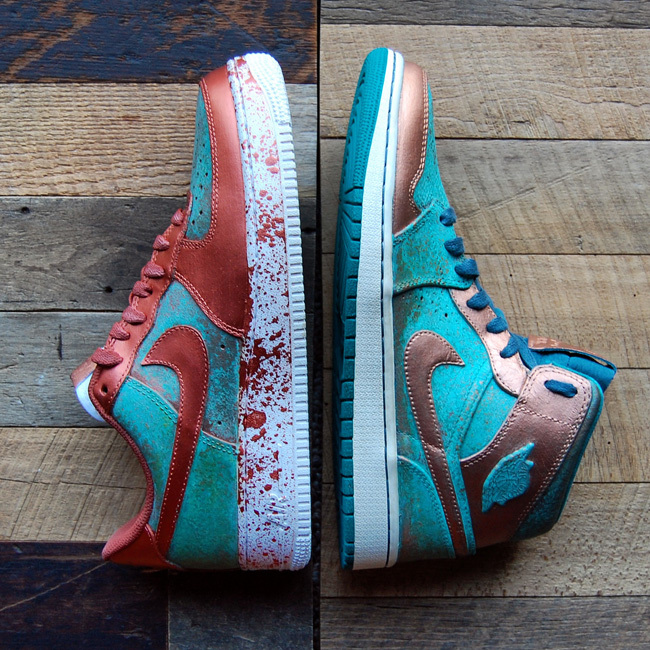 Chef was so inspired by his recent experimentation with Patina effect on Copper paint when working with Penny Hardaway on some 1 of 1 Custom Foamposites and Air Force Ones that he ported the theme over to the Jordan 1 Mid and remixed the AF1. Chef is offering both of these silhouettes in an exclusive online release with Massdrop.com The group-buy website will be placing one large order with GourmetKickz and offering a privileged price to all participants in the drop. Options include a custom box that is just as amazing as the sneakers. Choose between the AF1 and AJ1 or be a glutton and cop both! Click the image above or go to http://dro.ps/gkpatina to take part in this exclusive limited offering.